To say that we are excited for the new season of The Walking Dead, which is slated to grace our screens in a few days, is a huge understatement. This week, we decided to try out two of the highly recommended games of the genre: Zombicide and Last Night on Earth. Both of these games are very similar in a sense that both use miniatures with the board broken up in different tiles to make up a town or city where survivors of the zombie apocalypse maneuver around to accomplish different objectives, hacking or potentially falling prey to zombies at every turn. The similarities end there as both games have their own signature touch and flare to make them stand out. 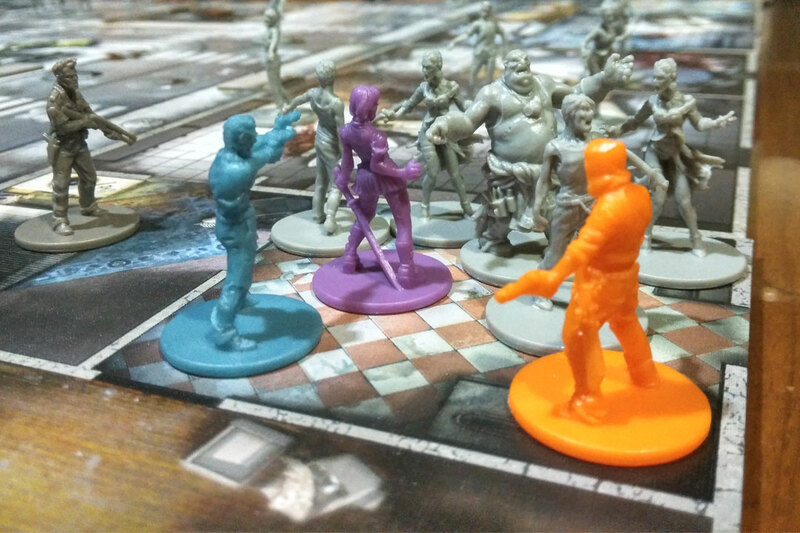 If you enjoyed playing Left 4 Dead on PC or XBox, you’re definitely going to enjoy Zombicide. It gives the same feel as the video game as you go around dense urban areas to complete your objectives and survive the zombie apocalypse. Zombicide even has 4 kinds of zombies, which sort of mirror the ones you find in Left 4 Dead. You’ve got your standard, shambling walker. A fatty (Yes, that’s what they’re called. I’m not being mean) which is like the Boomer from L4D, except it doesn’t explode and comes with 2 walkers as traveling companions instead. A runner which can take two actions, instead of the standard one. Last, but certainly not the least, an Abomination that is a hassle to take down if you don’t have the right equipment. Zombicide is purely cooperative, and trust me you guys will need to cooperate to survive some of these scenarios, for 1 to 6 players. Each scenario is unique and the mechanics have great way of setting the pace as you go through each building, finding yourself flanked by a horde of zombies. 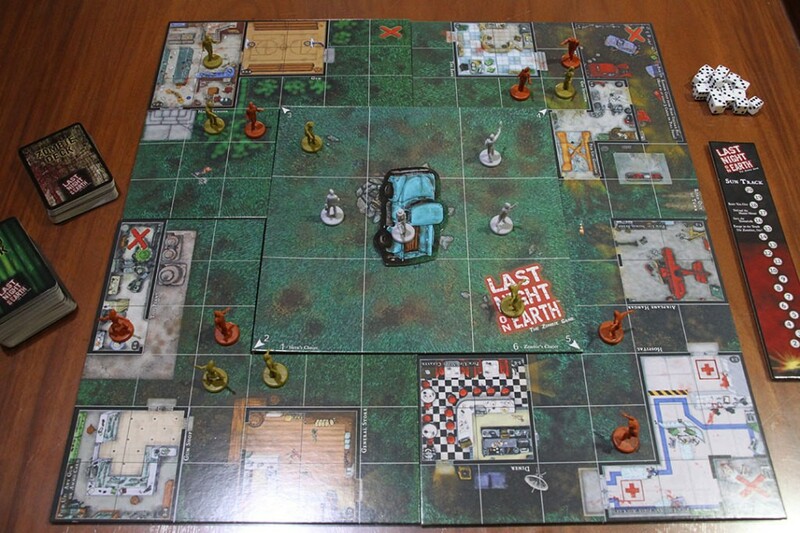 If Zombicide reminds me of Left 4 Dead, Last Night on Earth is kinda like the B-Movie that became a cult classic complete with the typical character archetypes, such as: The Quarterback, The Prom Queen, The Sheriff, and many others. It’s set in a small town in the US where, just like Zombicide, survivors mist complete a chosen scenario. The main difference here is that while Zombicide is purely cooperative, Last Night on Earth pits two teams against each other. One team controls the survivors as they go around to find the supplies they need to either escape the town or simply survive, while the other team controls the zombies as they shamble through the town in search of delicious brains to feed on. Should you buy these games? If you’re a fan of all things zombie, you should definitely get your hands on these games. However, it’s pretty difficult to say which one of the two you should get if you only have the budget for one game. They are both great zombie games that have great replay value because of the different scenarios plus the element of luck due to the dice rolling (Dice hate me). It all boils down to preference between a purely cooperative experience or if you want to take control of the zombies and feed on your friends. 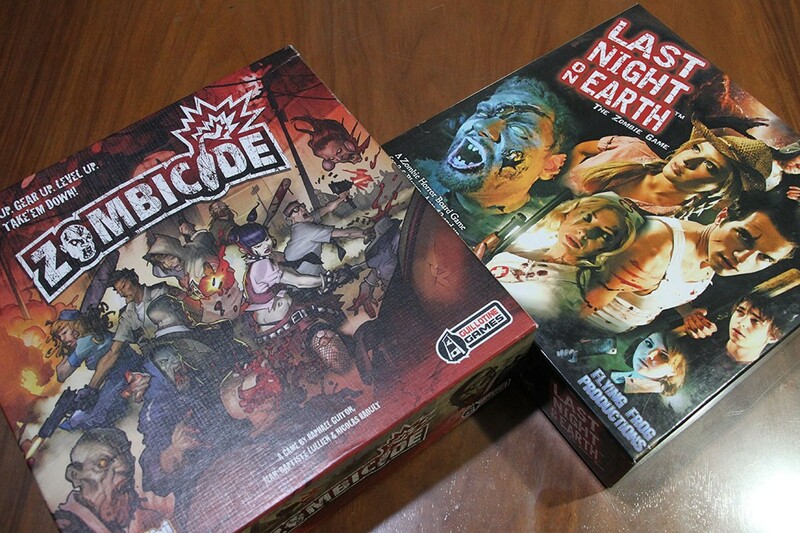 Zombicide and Last Night on Earth are available at Gaming Library for Php3770 and Php2500 respectively. Check Out These Cosplay Highlights from Toycon PH 2017!